Since moving away from using an Arduino for projects and using microcontrollers directly, I’ve lost the nice facility the Arduino has for sending debug information out the USART to the PC for display. It’s also very easy to connect to the Arduino to the PC for programming, since it is simply a USB connection. I decided to build a little circuit board which contained a 16 character by 2 line display based on the HD44780 chipset. This is normally a parallel device taking at least 6 pins to operate (10 in 8 bit mode), but my first project I was going to use the 16×2 LCD display was based on a ATTiny85 processor (8 pins total on the device), so I had to roll my own serial interface for the device. I decided to use an SPI interface, which had the added benefit that once I connected my debugging display to the SPI interface, I already had connections to the pins used by the TinyUSB programmer, so I was able to kill 2 birds with on stone; interface a debugging display and a programmer with a minimal set of breadboard wires. 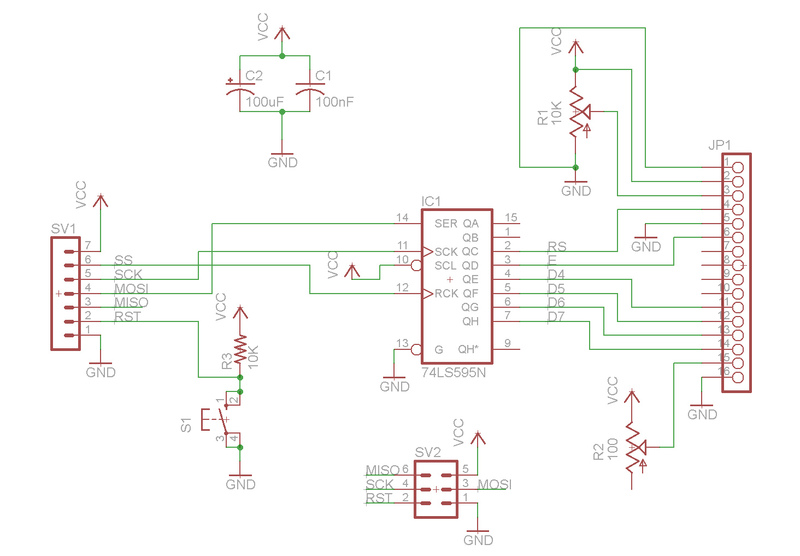 The circuit is very simple, with a 74LS595 Shift Register converting the serial data transmitted through the MOSI pin of the AVR chip, clocked by the SCK pin, and latched to the output through the SS pin. The board also includes pots for contrast and brightness of the LCD display, a reset switch, and the connector for the programmer. 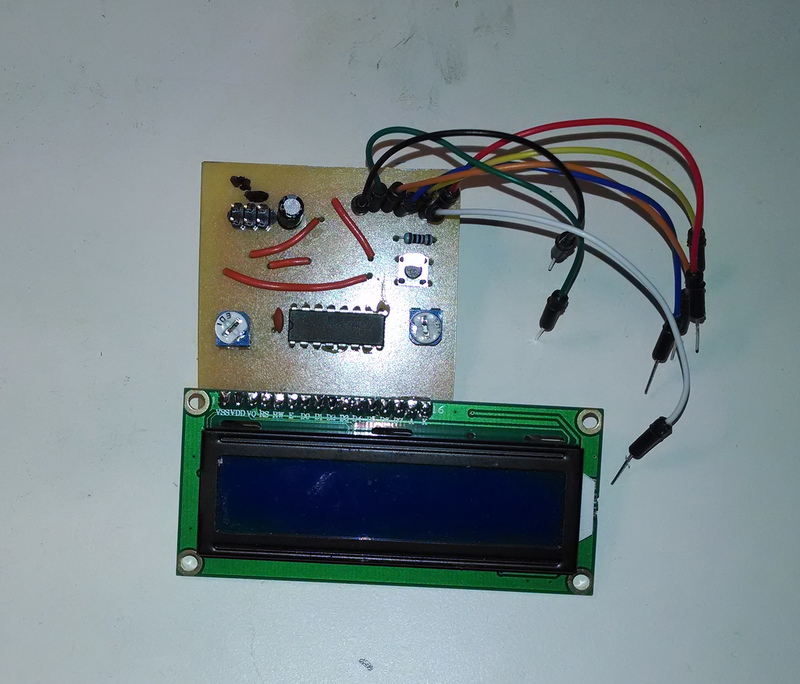 This entry was posted in AVR and tagged 16x2 LCD, 74LS595, ATMega 328, ATMega328, ATTiny 85, AVR, HD44780, SPI by kevinmkessler. Bookmark the permalink.